This tutorial shows you how to create an ASP.NET Core web app using Visual Studio and deploy it from Visual Studio to Azure App Service using continuous deployment. To complete this tutorial, you need a Microsoft Azure account. If you don’t have an account, you can activate your MSDN subscriber benefits or sign up for a free trial. You will also need a Visual Studio Team Services account. If you don’t have an account, you can sign up for free. ASP.NET Core (runtime and tooling). Hosted Build Pool servers in VSTS already have RC2 tooling installed. The Trackyon Advantage extension installed into your team services account. This adds an available zip task for later steps. Setup some build variables to make later steps clearer and easier to retain consistent paths across build steps. Create a variable for DeployPackage and set it to the path you would like the zipped web package to be at. We have used $(Build.StagingDirectory)/WebApplication.zip to have it alongside our published output. Use a Command Line build step to restore packages. Use another Command Line build step to publish the project. Compress the published output so it can be deployed to Azure App Service. We will use the Trackyon Advantage task we installed to zip the contents of our published output for deployment. Use the Azure Web App Deployment build step to publish the compressed publish output to your Azure Web App. The Web Deploy Package will be the output of the contents compressed in step 4. In this case, we re-use the variable for it’s path we setup earlier. VSTS Release management can alternatively be used to manage the release pipeline from the VSTS build. 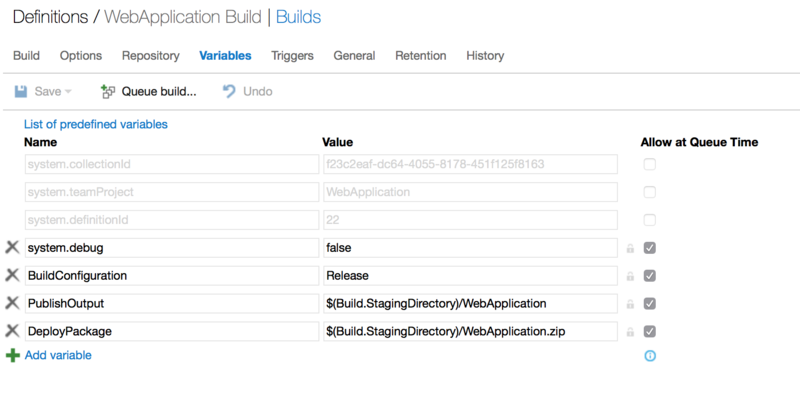 We require a small change to the build pipeline and setup of the release process. If configured, remove the Azure Web App Deployment step from the VSTS build setup in the previous section. You will be able to create a release definition and link to the Build definition and utilise the artifacts copied from step 2 here for publishing.